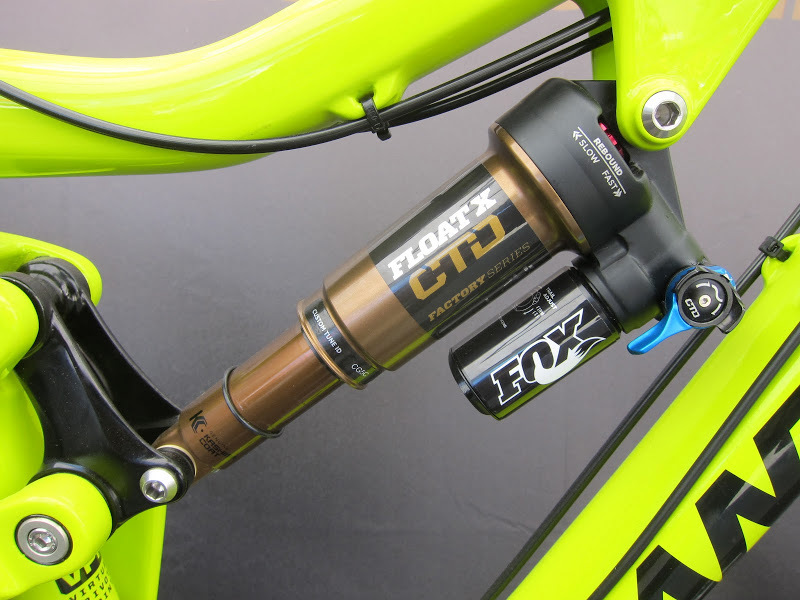 FOX unveiled new updates to their TALAS fork, along with a new rear shock, the FLOAT X. I got to see and play with the new units on Mark Jordan’s, FOX Global Communications Manager, tricked-out Santa Crux Bronson. The 2014 TALAS fork’s internals should offer smoother travel and improved handling, while the FLOAT X should be a great candidate for Enduro racing and longer travel bikes. 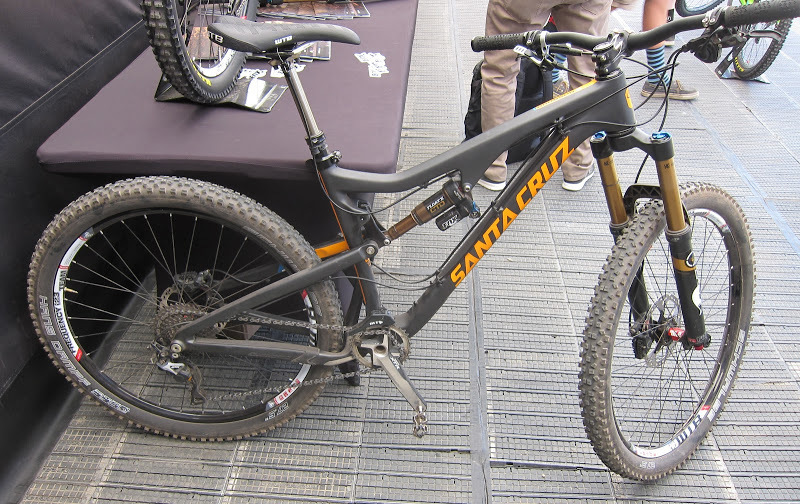 They also have a 40 27.5″ fork, which should see some action in this year World Cup races. 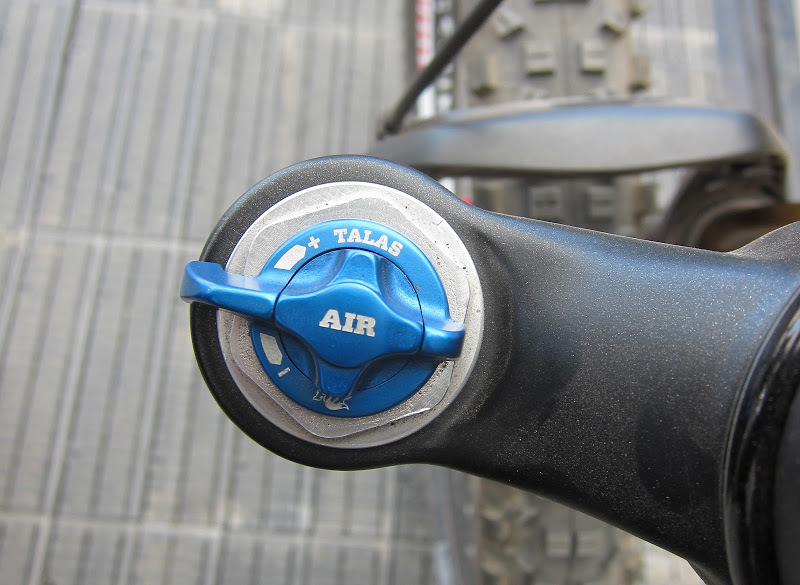 FOX is revamping their TALAS or Travel Adjustable Linear Air Spring system for 2014. The updated damping tunes give increased control, and the improved air spring offers faster travel changes and better suspension sensitivity. The new air spring closely matches their FLOAT design, with a better spring curve, and it’s firmer in the mid stroke over its predecessor. Another nice aspect of the self-contained design of the new TALAS cartridge is that it can be retrofitted into earlier models. I played with the TALAS on the bike, and it’s much quicker and seemed to have less stichion, though it was only a parking lot feeling. One oddity is that the lever now works in the opposite direction for engagement, so it will be a bit disconcerting until you get used to it (if you’re an existing TALAS owner). They’ll have the TALAS in 26″ 27.5″ and 29″ wheel sizes, and 32mm, 34mm and 36mm stanchions. They currently don’t have a 27.5″ TALAS in 36 as yet, but I am sure that will change. I am glad to see they changed the 160mm version of the TALAS to have a lower travel setting of 130mm instead of the current 120mm, which I always thought was too low. The 32 and 34 will use their CTD (Climb, Trail, Descend) integrated ride dynamics system and have 15mm TA, while the 36 will use the FIT RC2 and 20mm TA. The new FLOAT X rear shock is a piggyback design, and is oriented towards longer travel bikes and weighs in at a decently light 365 grams. The additional reservoir gives the shock an increased oil volume, which should help with heat generation, and offer a more consistent ride on long descent and during heavy use. It has adjustments for air, rebound and their CTD (Climb, Trail, Descend) integrated ride dynamics system, with three additional settings for the Trail mode. It shares damping features and improvements that were made to the DHX coil shocks, but it weighs 70 grams less than a DHX Air. The shock felt pretty good and was decently plush, and it was smooth through the stroke, and didn’t blow through the mid stroke easily. The new tune for the CTD seemed improved, though a full-on test needs to be done for final confirmation. I would be very interested in the new damper if it will fit in my ’10 TALAS 36mm 160. I always thought the travel adjust lever should go the other way. I have the 2013 TALAS (29er/34mm) and would love to upgrade to the new cartridge. Any idea of cost? You are far better off by having your existing cartridge modified by Push, Avalanche or some other reputable tuning company than buying another stock Fox suspension cartridge. The stock system is always a compromise. Has Fox fixed the forks so one can actualize promised travel? Til they do, not touching them. I get full travel on my 2013 34 Float all the time. Never had an issue – in fact I had to add more air to it than what the sag would suggest. Just ordered my Float X, should have it this week. Cant wait to put it through some punishment. installing it on my Santa Cruz Nomad C. Hope this thing kills it or I’m am CC Double Barrel. The only thing i wondered is why such a small air volume? why not advance to the larger air volume like Rock Shox or Cane Creeks DB. Just a thought. Oh and by the way, never had an issue with my Talas 36 160, i get full travel. Any word yet on how this stacks up against the new RS Pike? I haven’t tested the Pike, RS has been very forthcoming to get us a test fork.